Seco-Larm Enforcer Green Mushroom Button Push-to-Exit Plate, White (SD-7217GWQ) by Seco-Larm at Mamboe. MPN: SD-7217GWQ. Hurry! Limited time offer. Offer valid only while supplies last. The Seco-Larm Enforcer Green Mushroom Button Push-to-Exit Plate, White is a simple mushroom cap push-to-exit button with a white plastic face-plate. 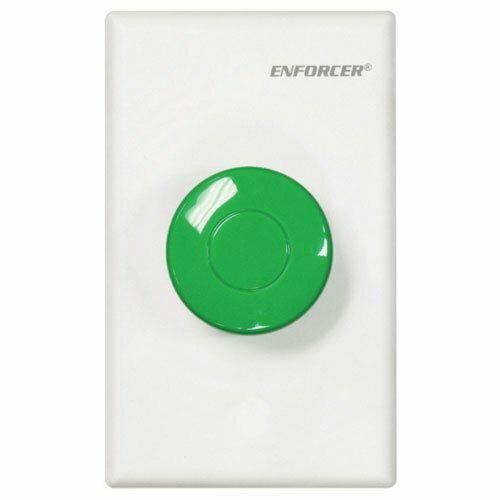 The Seco-Larm Enforcer Green Mushroom Button Push-to-Exit Plate, White is a simple mushroom cap push-to-exit button with a white plastic face-plate. Fits into standard single-gang box. No exposed screws. View More In Access-Control Keypads. If you have any questions about this product by Seco-Larm, contact us by completing and submitting the form below. If you are looking for a specif part number, please include it with your message.